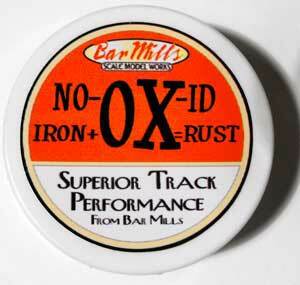 I was contacted by a lady who was trying to buy some No-Ox and Bar Mills told her it has been discontinued because it works so well you only have to buy it once! How's that for a testimonial. Some hobby stores may have some lying around or you might get lucky on eBay. My friend, John Houghton, uses it on his N scale layout with great success. I will be using it again when the new layout is built. At the moment there is too much dust while I build the subroadbed. Below is some background on the product should you find some and want to try it. 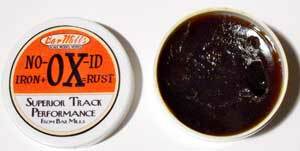 No-Ox-ID is a track cleaning paste that was made for model railroads by Bar Mills. I acquired a container in April, 2012. It's supposed to prevent oxidation to improve electrical pickup for a very long time. It's advertised as superior track performance. We'll see if it lives up to the hype. The instructions are to clean the track first with a brite boy or fine sandpaper to remove any oxidation and follow up with a rag and alcohol to remove dirt and fine particles. Then the rail should be vacuumed to ensure cleanliness. To do this properly all engines and rolling stock should be removed from the layout, wheels should be cleaned and scenery glued down.I didn't do all of this. I had cleaned all the track with an abrasive brite boy pad a few days previously, but I hadn't gone further. My previous Utopia Northern RR had a lot of track and over 300 cars. All the cars were located according to the car card waybill system I was using. I wasn't going to try taking everything off the layout in the midst of an operating cycle. Most of my rolling stock has metal wheels. I replace plastic wheels when a car comes off for maintenance or when I spot one and have some wheelsets on hand. So my experiment with No-Ox would be interesting. No-Ox can be applied with a finger tip. 1/4 teaspoon is supposed to be enough for 500 feet of N scale track. There's enough in the container to last me and all my operators a lifetime! Note my finger tip applicator. You need very little. The instructions say to run your locomotives (with clean wheels) over all your track. No rolling stock yet. This is to spread the No-Ox withot adding dirt. Then locomotives are to be removed and all rails wiped with a clean rag to remove any excess product. Again, I didn't do this. I only applied some No-Ox to sections of the mainline that I could reach easily. I didn't vacuum or wipe the rails clean because I didn't want to disturb the scenery, buildings or rolling stock.I did notice some slippage on the grades. The instructions warn that this can happen. As I had applied the No-Ox shortly before an operating session it was necessary to doublehead on the grades or to reduce the train length and get up the grade in two sections. This just added to the fun. I told my operators it had rained recently and to use more sand. I got a few odd looks. No-Ox is supposed to protect your track from oxidation almost permanently. It cost less than $10 Cdn so it was a small investment. We'll see how it works. So far so good. I will continue to clean the wheels on locomotives with alcohol on a regular basis and wheels on cars are cleaned when they come off the layout for any reason.That should help. I think most model railroaders will not follow the instructions exactly so this should be a good "in practice" experiment. I plan to clean everything on my new UNRR model railroad after I get the track laid and ballasted. Fellow member of our train club and one of my operators, John Houghton, has an N-scale layout he is building at home. He tried my can of No-Ox and reported excellent success. He has now been using it for several years. He has not had to reclean his track except for the odd touch up. I operate on his layout and everything runs flawlessly. John followed the directions closely. He carefully and completely cleaned the track with alcohol before applying the No-Ox. I continue to clean the wheels on locomotives with Aero fluid or alcohol after a few sessions if they appear to be acting up. I find dirt on the cloth. I think that, even though I have metal wheels on most cars, that I was tracking some crud around the layout's trackage. I will clean all the wheels before operating my new layout. It's a good time to check each car's weight, couplers and details. I would say that the No-Ox has certainly helped. There was less slippage on the grades so the No-Ox must have spread around more or had worn off. Go from "no-ox" to my Track Cleaning Tips page. Return from "no-ox" to my Home Page. HOW TO PROTECT YOUR IDENTITY!